Living in an age of frequent and monumental technology advances, it can be refreshing when somebody pauses to consider whether piling innovation upon innovation is absolutely necessary. Rather than progress for progress’s sake, perhaps a simple solution is just as efficient, as shown by the Alloy Yachts sailing yacht Encore. After a 17-year love affair with Eclipse (formerly Esprit), the Australian owners decided it was time for a replacement. 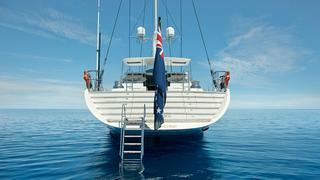 Esprit was the first Dubois Naval Architects-designed superyacht constructed by Alloy Yachts in New Zealand. Launched in 1991, she began a fruitful collaboration between the yard and design studio that has now seen 22 projects launched. When it came to replacing Eclipse, the owners certainly gave no consideration to any other combination and signed Alloy and Dubois to come up with a larger, modern reprise of the yacht that had clocked up more than 300,000 trouble-free miles. Appropriately named, Encore is 43.9 metres, notably larger than Eclipse’s 32 metres, but there is no mistaking a striking resemblance to her predecessor. Against the current fashion of more vertical bows, Encore repeats the 50-degree rake on Eclipse. And against the trend of complex transoms that transform into boarding platforms, or stairways and access ways to cavernous garages, Encore returns to an early Dubois signature with a fixed boarding platform and a series of transom-wide steps leading up to the aft deck. Instead of today’s dark hulls, Encore presents a handsome white finish, like Eclipse, with relatively modest in-hull windows. There is even a substantial belting to protect the side of the hull and create something of an accent line, also reminiscent of Eclipse. Clearly these owners are not under any compulsion to make rash diversions from the tried and true. 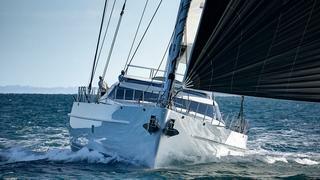 Their 17-year relationship with_ _their previous yacht is matched by a similar relationship with Jonathan Wishart, their captain, who was on site throughout the build. The yard’s project coordinator, Greg Yeo, confirmed that Wishart constantly tugged back from over-automation of systems in favour of good old analogue solutions. “Technically, this is a much simpler boat than some of our more recent projects,” says Yeo. Keeping faith with the styling of their previous yacht was not just a matter of nostalgia: practical benefits accrued as well. The raked bow of Encore, for example, not only provides reserve buoyancy for a seakindly motion, but also allows the anchors to drop straight out of bow pockets, removing the need for complex stowing systems or extending support arms. The white paint finish is cool in the tropics, reducing demand on air-conditioning and refrigeration systems, while the open transom arrangement removes the need for articulating fold-out systems and powerful hydraulics. Simplifying systems at the bow and stern has the added benefit of reducing weight at the most weight-critical locations in the boat, further improving seakeeping. For all this paring back, Encore should not represent a negative attitude to technology or progress, rather she represents a judicious intelligence to distinguish between fashion and real function. 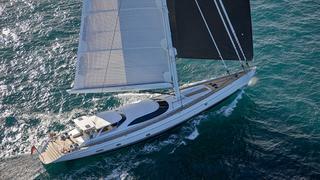 So, for example, where technology aids sailing performance or efficiency it has been fully embraced. The owner’s previous yacht was the world’s first superyacht with a carbon fibre rig. Having travelled hundreds of thousands of sea miles under that reliable Southern Spars rig, the owners have gone for the full package this time: Southern Spars’ latest carbon fibre five-spreader mast and in-boom furling system complete with a full set of EC6+ composite standing rigging. Where Eclipse featured two furling headsails, Encore has three: a reacher, a blade and a staysail, all on Reckmann furlers. 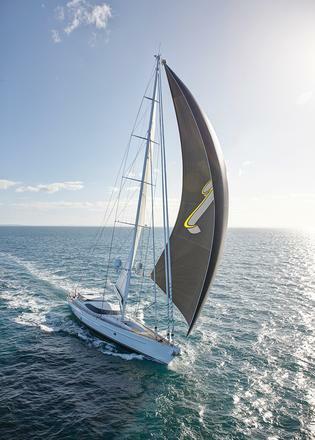 The sail wardrobe is by Doyle, using its latest Stratis composite technology. The latest and best applies also to Encore's hull, which draws full benefit from two decades of intensive tank testing and development by the Dubois team for improved sailing efficiency and performance. Equally, despite the return to some styling features of 20 years ago, it would be wrong to regard this as a retro yacht. 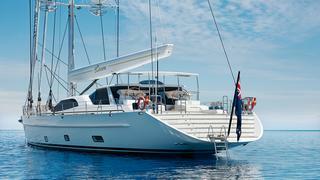 The superstructure is thoroughly modern, with clean sculpted lines flowing smoothly fore and aft. The Eclipse heritage is hinted at, but this is a much more refined outcome with Encore. Over the cockpit, the profile takes a subtle step up with a fixed glass windshield wrapping around the front. This, in turn, echoes the raked glass that sweeps around the forward rise of the superstructure, providing drama to the external lines and a marvellous source of light and space to the saloon below. A fixed hardtop allows the roofline to flow seamlessly from front to back, totally integrating the above-deck aesthetics, while overall, the angled bow and stern treatments give Encore a more genteel look, less aggressive than the contemporary trend to blunt ends. This classic inclination is mirrored in the interior, which was designed by the owner working directly with the yard’s interior design department. 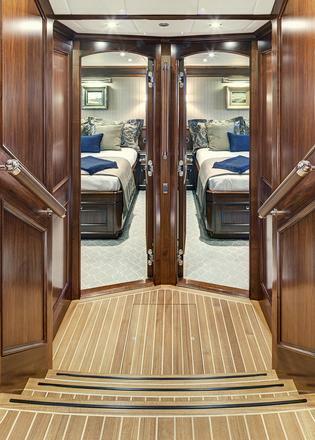 From the cockpit, sliding doors provide access inside, where raised and fielded walnut panels and Ralph Lauren fabrics enfold occupants in a clubby atmosphere – although there is nothing dark and smoky about it. The glass windshield transforms from an almost horizontal plane across the front to vertical planes as it wraps around the sides. Light pours in and the views from the upper saloon, sitting or standing, are panoramic. In the formal main saloon of Encore, the glass screen becomes a domed ceiling supported by substantial mullions, with views up the rig to the sky or stars beyond. 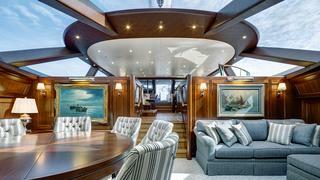 Entertaining family and friends is a high priority and a very large bar dominates the port side of the upper saloon. Opposite, for informal meals, is a square dining table with cream leather sofas. Just forward of the upper seating area is an internal stand-up navigation station, unobtrusive with the walnut covers down, but fully functional when required, with all the systems neatly at hand. The more formal lower saloon has a discrete lounge area and a round dining table. It is not often that a dining table has the power to move one to spontaneous applause, but this one is a rare mechanical marvel. It is a Fletcher Capstan table, constructed by David Fletcher to a complex geometric formula. Rotating the tabletop activates a mechanism like a sophisticated timepiece and allows the table to expand from an eight-seater to a 12-seater. As new wedge-shaped leaves magically emerge from inside the table and click into place with absolute precision, it resembles something from the Da Vinci Code, or Harry Potter. These pieces are bespoke and the cost of one is said to start at a basic £25,000. Clearly, owners willing to spend the equivalent of a luxury sports car on a dining table take food seriously and this is quickly confirmed by a visit to the galley. Although the owners travel with a French chef on board, there is no shortage of enthusiastic amateurs. Captain Wishart himself enjoys cooking, as does the owner’s wife. 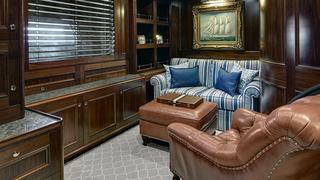 By design, Encore's galley can accommodate a crowd. Set around a granite-topped central island, it features two ovens, two microwaves, a warming drawer, two induction cooktops, a conventional electric cooktop and a salamander grill unit that rises out of the counter surface on demand. Two barbecues are outdoors. “There is a lot of informality on board,” says Wishart. “We are often all cooking together and then sit down to enjoy meals together. There is nothing flashy or over-pretentious. It is very family oriented. This inclusive atmosphere is underscored by the fact that the furnishing and joinery in the crew area is finished to the same quality and uses the same materials as in the guest areas. 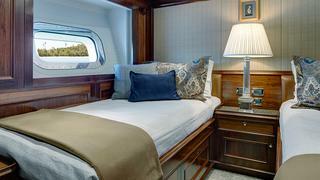 Owners and guests are accommodated on the lower deck. A staircase from the upper saloon curves down to a lobby with four suites radiating from it. 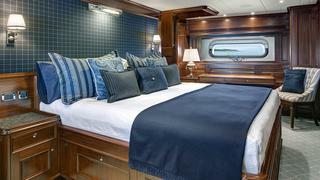 Two are mirror-image VIP suites, while the third is a twin suite with a Pullman berth. A potential fourth guest suite has been sacrificed on _Encore _to enlarge the owner’s area into a discrete apartment, with its own library-lounge-study area as an anteroom with the bedroom spanning the full beam aft. This provides a retreat where the owners can enjoy a spacious private area to read, watch films or attend to business affairs. The build was completed in two and a half years, and was the first project at Alloy Yachts to utilise its Advanced Yacht Building Program (AYBP). This is based on the lean manufacturing philosophy that originally emerged from Toyota in Japan and essentially seeks to smooth workflow and reduce waste throughout the construction cycle. “We think about it in terms of hours per tonne,” says Yeo. 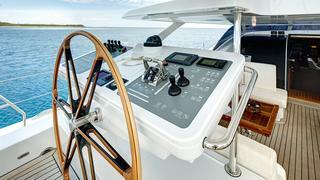 “This was the first boat to use the system and, in fact, it came on stream after we had started construction. Part of it involves milestones and we were already at Milestone Nine with Encore when we applied AYBP. The effect was dramatic.